Chalet rated with 4 stars, with a 1700 m² gardens and with beautiful view of the Mont Blanc. 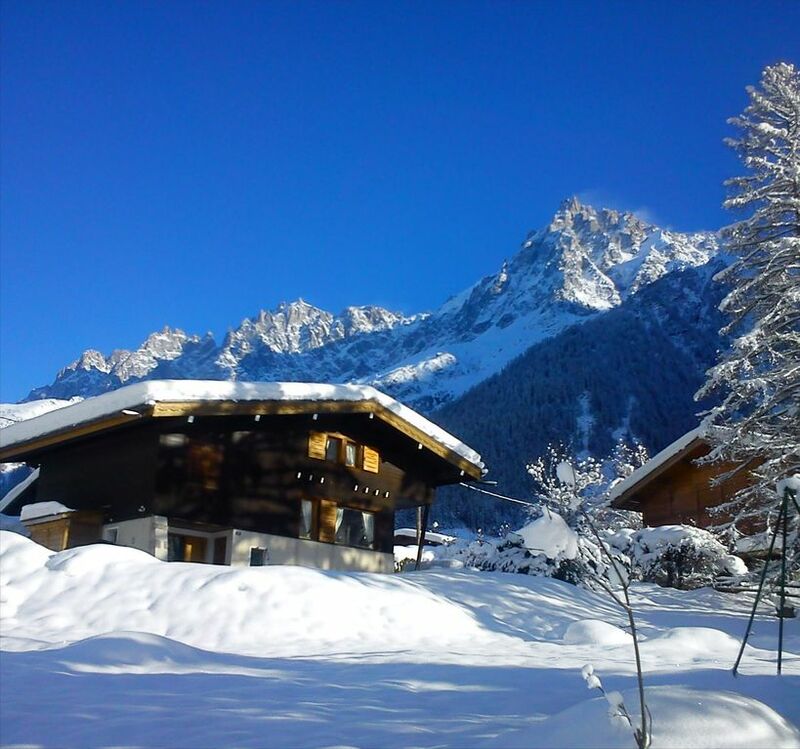 Located in the hamlet of “Les Houches “, village in the heart of the Chamonix valley. It is in the middle of Les Houches and Chamonix (approx. 3 km). The living room is facing the garden, with an extended open space terrace including a table for al fresco meals, large umbrella and sun beds. On your arrival beds will be already made, tea and coffee will be available and in winter an open fire will be ready to light a fire. Bathrooms are small but complete, including bathtub, shower, heated towel rail, well lighted mirror and hair dryer. Bathroom linen is of very good quality and it matches the bed linen. The oil central heating system has an external temperature control that provides a constant temperature inside the cabin, beside the heating system there is a laundry area (washing machine, iron and iron table); the kitchen is very comfortable and well equipped. In the living room there is a big flat screen TV, DVD player, a Hi-Fi system, CD and tape player, and some books for reading in front of a fire in the open fire (wood provided). We had a lovely week in Colette's chalet. It was just the right size for our group of 4 adults and 5 kids. It had everything we needed for the week, including washing machine, DVD player and raclette machine. The large open fire was a highlight, as was the large garden which the kids loved sledging and building snowmen in. It's a 15 minute drive to the Prarion lift, and definitely better to use the car rather than bus, but you'll need snow chains to get up the hill out of the cul-de-sac if it snows overnight. All in all, a very pleasant week, much enjoyed by all. We arrived late and Collette was there to meet us with cheese, salami and a bottle of wine !! She was a great host. The house was spacious, clean and comfortable. It is in a quiet location, with incredible views of Mt Blanc and the glacier. The patio is an added bonus to the perfect french house. We loved it and can't wait to return again !!! Excellent value for money. Lovely chalet and nice space at front for children to play . Helpful owner and nice lady Sophie who we dealt with. Very few cars as cul de sac . I will stay again if I can . I am in love with this area and would move there if I could ! Fijn huis, goed uitgeruste keuken, badkamer en ook vooral het skihok beneden! Ideale locatie, prettige sfeer, openhaard is top en zo aan de voet van de Mont Blanc! Nous avons passé un très agréable séjour dans ce chalet bien équipé, bon agencement intérieur pratique pour les sports d'hiver. L'accueil a été trés chaleureux tant de la part de la propriétaire que de Sophie. Quel plaisir de se réveiller le matin et de pouvoir admirer un tel panorama : les aiguilles de Chamonix dont la célèbre aiguille du midi, le Mont Blanc, le Brévent... ! Seul petit bémol mais qui n'est pas du fait de la location : l'accès aux pistes avec un service de bus gratuits certes mais souvent très remplis ne permettant pas leur utilisation ou nécessitant une attente très longue entre deux navettes. Dommage également que les chauffeurs ne soient pas très agréables.